Where abouts in the world are you and whats your budget? 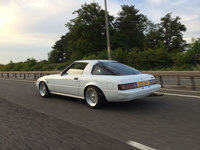 Most of the UK 1st Gen RX7's that come up for sale figure in the Spotter's Corner on here. Wasnt there a series 2 on a facebook page at 2k recently? I think wires posted a link to it? £3500 seems a healthy budget for an fb, some appear ridiculously priced. Have you phoned around the specialists? I think you might have been upgraded now by Ian. So Spotters Corner might be open to you.